The roar returned and new point leaders emerged Friday, June 8, at the Boone County Raceway in Albion. The local fairgrounds facility was able to complete a full Friday racing program for the first time since May 18. 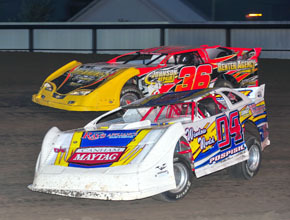 The May 25 card was halted by rain following heat races and the scheduled June 1 races were cancelled due to more rain. Friday’s crowd was treated to a full slate of heats and features – and more – as the BCR ran its regular weekly line-up, plus make-up feature races to complete the May 25 program. Three drivers took advantage of Friday’s racing to regain season point leads they had once held, but lost prior to weather cancellations. Tad Pospisil jumped past fellow Norfolk driver Robert Osborne in the Limited Late Model class, while in IMCA Modified competition, Albion’s Jacob Anson moved back in front of hometown rival Tyler Iverson. TeJay Miekle of Norfolk, the early-season Street Stock leader, won both A Features in that division and overtook Petersburg’s Randy Pelster, who had led following May 15 racing. Leaders protected their positions in the other BCR classes Friday, With Jason Wilkinson of Neligh (Hobby Stock), Cameron Meyer of Pierce (Sport Compact) and Norfolk’s Kyle Prauner (Sport Mod) retaining their leads. Further Results & Point Standings in Print & Online Editions of Albion News.